In a 2007 interview with Reverse Shot, upon the release of his wonderful film Offside, Jafar Panahi said, “I have made a resolution for myself that I should only make good movies, and so, even though it takes me three years to make a movie now, I’m really just trying to make the best career I can.” Of course, this was before Panahi was arrested and officially banned from making movies by the Iranian government in 2010, a turn of events that has proven to be transformative rather than ruinous for his career. It’s certainly not incidental that so many of his films that had consistently challenged and angered Iranian officials featured female protagonists, such as The White Balloon, The Mirror, The Circle, and Offside, the latter two being fairly direct condemnations of the social and political marginalization of women. The marvelously inventive films that Panahi has surreptitiously made since his official moviemaking ban—This Is Not a Film, Closed Curtain, Taxi—have been more inward-looking, self-reflexive out of both necessity and tendency, and naturally functioning within circumscribed boundaries and spaces. His newest, 3 Faces, is the most freeform and expansive of the cycle of movies that has come to define the latter part of his filmography, and, crucially, it’s the film that brings him back to the feminist concerns that fueled so many of his definitive earlier works. The film begins in a space of foreboding despair and anguish. Filming herself on a cellphone video apparently shot in a cave, a crying young woman named Marziyeh desperately asks that the video we’re watching be forwarded to film actress Behnaz Jafari (perhaps best known to U.S. viewers for her performance in Samira Makhmalbaf’s Blackboards). After tearfully explaining that she has studied acting from a young age and her dreams of a film career have been dashed by members of her family, who refuse to allow it, Marziyeh puts her head in a noose. She then seems to kill herself on video, though the characters who turn out to be viewing the video—Behnaz Jafari and Jafar Panahi, as themselves—are in disagreement over whether the video actually shows a suicide. Jafari suspects the video is edited upon the girl’s fall; Panahi doesn’t see a cut and is convinced it’s real. The emotional, highly charged debate over the video’s provenance and authenticity functions as starting point for a film that, to take a page from the late Iranian master Abbas Kiarostami (clearly a guiding light here), is concerned with what’s “real” and not. 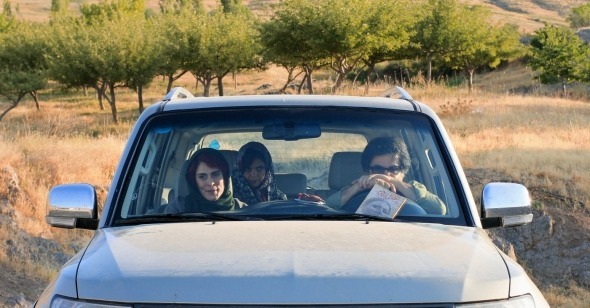 Though Marziyeh says in the video that she has been trying to contact Jafari, desperately sending her emails, the actress—her stricken face caught in long take close-ups in the passenger side of Panahi’s SUV for much of the film’s first movement—claims she has no trace of this. Nevertheless, her guilt and curiosity are stirred. Aware of the remote village that the allegedly dead girl comes from, the two have set out to locate her and find out the truth about her actions, which because of what she says on this shared video, now in some way implicate Jafari. Also recalling Kiarostami in structure, Panahi’s 3 Faces, like Taste of Cherry and Where Is the Friend’s Home? takes the form of a road movie, which then expands out to interrogate so much more than the apparent single-minded mission would initially seem. As it progresses it becomes clear that 3 Faces is less concerned with its central mystery than with questions around tradition, language, mortality, and, most crucially, the continued marginalization of women in Iranian society. Despite the desperation and potential tragedy depicted in the opening scene, 3 Faces soon becomes rather playful. While en route, Panahi gets a cellphone call from his mother wondering where he’s gone; we only hear his side of the conversation, which is mostly Panahi trying to convince her not to worry that, no, he’s not in the midst of making another movie. (And since this assiduously written film—which won Best Screenplay at the Cannes Film Festival—is neither a documentary, nor takes the form of a fictionalized one, Panahi’s not necessarily lying to his mother, as far as we know.) Poking fun at his political predicament as well as his newfound persona as a rebel filmmaker who defies the restrictions put upon him, this amusing self-reflexive passage confirms, as his previous film Taxi had begun to show, that Panahi has rediscovered a casual, freeform approach that allows room for humor. The film’s already apparent tonal shifts augur an unpredictable trip, and indeed the many encounters Panahi and Jafari have along the way keep throwing the film off its seeming course, from an old woman comfortably trying our her own grave to a farmer attending to a bull dying in the road after a bad fall to a little girl who, recognizing Jafari from her movies, requests an autograph before guiding them to Marziyeh’s village. Crucially, the director and actor are traveling to a small town located near the border of Turkey in northwest Iran. This leads to many conversations in which local characters must toggle from speaking Turkish to Persian for the sake of our mildly intrepid explorers (after Persians, the Azerbaijani Turks are the nation’s second largest ethnic group, though they only comprise 16% of the population). In addition to this cultural-geographical divide, 3 Faces interrogates the space between the urban and the rural, the poor and the middle-class, modernity and tradition, male and female, night and day. After they’ve finally reached Marziyeh’s house, it becomes clear that the young woman has been treated poorly by family and the community at large, which is partly to blame for her apparent disappearance. Local men talk of her desire to become an actress as a disgrace, as though she has brought shame to the village. There’s a keenly felt, at times absurd patriarchal traditionalism that keeps rearing its head: at one point, Jafari experiences this first hand when a local older man regales her with stories of his son’s circumcision, before handing her a gift—his son’s preserved foreskin, salted and wrapped in a handkerchief, meant to symbolize virility. Jafari plasters on a befuddled, respectful smile. As the director, though, Panahi seems genuinely put off by such expressions of proud machismo. Panahi’s respect for and interest in the lives of women has long been evident in his work, yet 3 Faces, in its final passages, reveals itself as partly an admittance that he cannot penetrate their world; the sisterhood of women is off limits to him. Once the Marziyeh mystery is resolved, 3 Faces continues to shape-shift, introducing another character, though one who tantalizingly remains off-screen. Shahrazade is an aging former actress and dancer from pre-revolution Iran who lives near the village. So poorly treated by men in the industry, she has long receded from public life, her plight functioning as a kind of parallel to that of the young Marziyeh. Panahi makes Shahrazade the crucial final figure, though she is shown only as a distant silhouette seen through her window as she dances that night with other women, including Jafari. Her house is a safe space, a world she has created for herself, and we are not privileged to enter it. We stay back at the car with Panahi, whose perspective we remain wedded to. Though we never are allowed to see her, Shahrazade must be the third face, after Marziyeh and Jafari. She’s another actress, another struggling soul. Panahi’s respectful distance is an expression of his solidarity with the eternally oppressed.